Once a week I just always aim to use a clarifying shampoo, to wash out all the products build up and to make my hair look less dull. Not going to lie, I tend to apply lots of products on my hair and after a while they start looking greasy, even after few hours of wash, not a good look. Normally I wash my hair every 2/3days. Just to let you know I also have sensitive scalps, so not all shampoos are good for me. 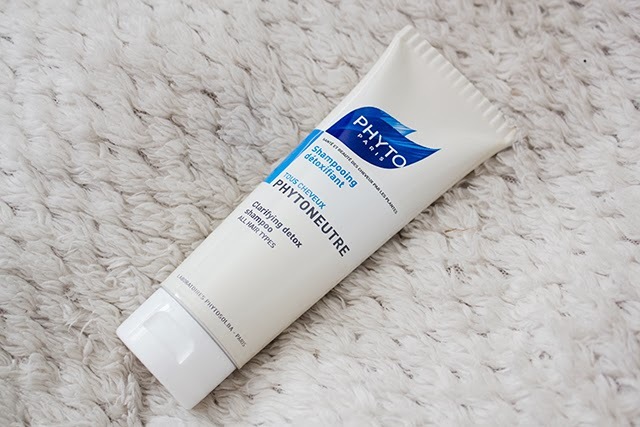 Phyto Clarifying Detox Shampoo became one of my favorite build up removing shampoo. The smell is very minty and fresh, you can actually feel the coolness of the mint while you work the shampoo. It does foam up a little, but it's not really foamy, so the foam won't dry out the hair. I like the packaging, but once you get to the point where you are almost out of the product, it's really difficult to get the rest out. The shampoo does clarify the hair really well and leaves them feeling weightless. I wouldn't recommend using this shampoo too often as it may damage your natural hair oils system(can't really think of a name). I also like to use a deep conditioner in combination with the Phyto Clarifying Detox Shampoo. The product works well with my sensitive scalps, it doesn't dry them out. I am currently on my second tube and I will definitely still repurchase. What's your favorite clarifying shampoos? Or do you just skip this step? This is a really good idea to do once a week, I think I may have to try it! sounds amazing! I have a really sensitive scalp too, and some products really irritate it! I love the boots own brand clarifying shampoo - cheap and effective! I've only ever tried the Herbal Essences Clarifying Shampoo which seems alright. However, I've never had anything to compare it to, this sounds very good.